Website Ranking Checker - das kwoxt! Website Ranking Checker (WRC) is a completely free tool for monitoring your website ranking on Search Engines like Google. Currently there are Google and Bing available, but we have plans for more. With WRC you search for phrases on a Search Engine. The result will now be scanned and the searched website (e.g. kwoxer.de) will be looked up. That's the whole thing behind WRC. The first hit always counts. The data is stored locally and on top of this you can easily backup the database file. You are even able to backup when WRC is running and for sure using multiple database files if you don't want to mix up domains. Before starting WRC you should change the Rankings1.s3db name to e.g. 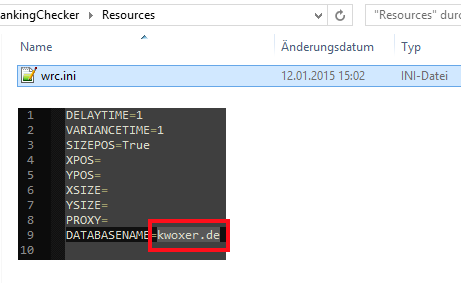 kwoxer.de.s3db. The file is equal to the database name. You should now also change the default database name to this one. This is pretty simple. Just go to Resources/wrc.ini. There you type in the same name. Hint: for sure you can also do those things in the tool later on. You could for sure put all searches into one database. But if you own more then one website it makes sense to split them up into different databases. Here I show you how it could look like when you have added another. Now you can start WRC and will have an empty database. 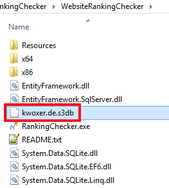 The default database you specified above is always the active one when you start WRC. Now the first thing is adding some Searches. You can do this with the New Search button. So now let's say we have added some searches. After that we check if there are results on our searches. To do this hit Run Searches. 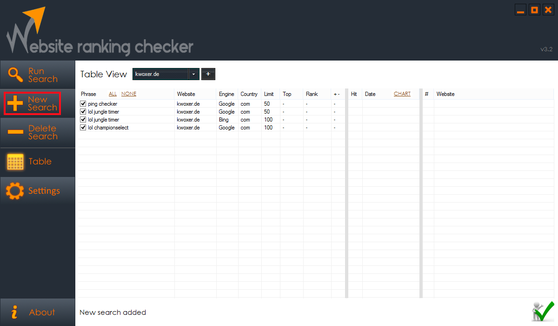 But just to mention that with doing this WRC is only checking those searches that are also checked in the table. So if you want to exclude some, simply uncheck them or use the ALL and NONE buttons. After clicking Run Searches you will be able to actually look on the result list of the current search on the right side. If you click on a Search entry in the list you will get back all the hits you ever have collected of that selected search. You can optional switch to a Chart view which is visually showing all the stuff you have ever collected. Download is available for the latest version. Simply download and extract it. Backing up a database is very easy. First close WRC and then go into the WRC-folder. Find the file Rankings1.s3db and simply copy it somewhere else. If you do some crazy stuff like deleting all searches, then you can simply replace the current file with your saved backup. It's very easy. WRC is using SQLite as database engine. That means it's a RDBMS database like MySQL. But compared to MySQL in SQLite you don't need a running server. So it's just a simple file. That means any SQLite tool can read this file. So even if you decide to not use WRC anymore, your data is not lost. I recommend the DB Browser for SQLite. 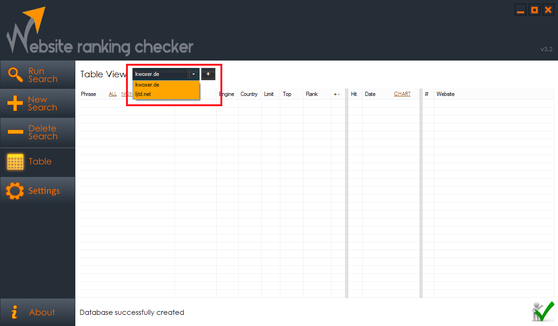 A really fast and good tool where you can add data, do some querys and so on. Well it's always a hide and seek. So in my tests Google was not able to detect a mis-usage of it's Search Engine. But if you mention anything for yourself, please let me know over the comment section. Thanks. Another good thing is that you not even need to have an API key or an account of the search engine. If you don't use the IE you are anonymous in any term. The only thing that can happen is that Google is blocking your IP after many searches. But WRC has some ways to behave like a real user, too. 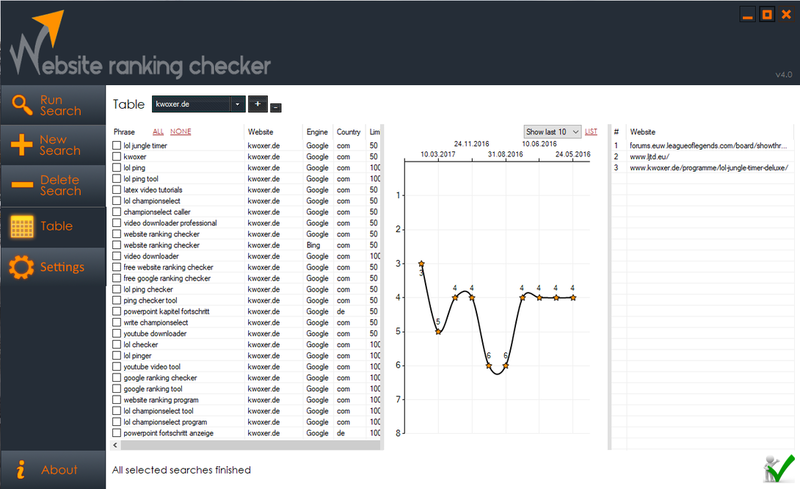 Here I created a comparison of Website Ranking Checker against the most known software Free Monitor for Google. For there are many more tools out there but all of them are having too many ads and/or is an online tool. 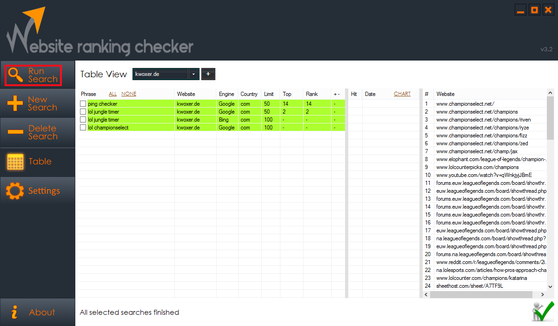 As you can see Website Ranking Checker is dominating in nearly any measure. But this is also something that is planned for further versions. We have a special History site for what each version came with and what we are planning in the future. To improve this application it would be awesome if you could take some time to write a feedback or even if you found bugs you can help to improve this tool even more. Also let me know what else you would improve. I'm open for any constructive idea. I'm really looking forward to all comments you have. Thank you for using the Championselect Caller. Comments are allowed in English or German. Danke für den finalen Release. Seit Anfang des Projektes hat sich ja einiges getan. Ich finde der Fortschritt ist echt bemerkenswert. Ich als Webmaster war auch schon lange auf der Suche nach einem Tool gewesen und konnte leider nur das aus deiner Gegenüberstellungen ausmachen. Gerne hätte ich mir hier mehr Alternativen gewünscht, weil der Monitor doch eher kläglich ist, was die Usability anbelangt. Aber nun ist ja endlich dein Tool veröffentlicht und nach kurzem Test, möchte ich es nicht mehr missen. Zwar kann ich nach dem kurzen Test noch nicht all-zuviel äußern, aber der Ersteindruck ist sehr gut. Ich werde dein Tool auch an meine Kollegen empfehlen. Sehr gute Arbeit und weiter so. Hab dir auch gleich einmal eine Spende hinterlassen. Gute Arbeit muss belohnt werden. Vielen herzlichen Dank für den ausführlichen Bericht und deine Spende, Micha. Thanks for this amazing tool. Working whole day with it and it's working super fast and having a great design. Good job also with the overall procedure like ad-free and portable. Will definitily keep on using your tool. So thank you again and have a great day and successful day. Thank you too Triv. I again uploaded a new improved version. Fixed many little things. ich nutze seit vielen Jahren den Free Monitor for Google und bin froh, dass es nun eine Alternative dazu gibt. Dein Tool funktioniert einwandfrei, die Optik gefällt mir und die optionale Grafikdarstellung macht es besser als das zuvor genannte Werkzeug. Ich war jedoch nicht in der Lage, mir nach der Suche die Ergebnisse anzusehen. Es wird stets nur das Ergebnis des letzten Suchbegriffes angezeigt. Hallo Susanne, ja das stimmt. Derzeit sieht man immer nur die Ergebnisliste der letzten durchgeführten Suche. Aber diese Suchen mit abzuspeichern war in erster Linie großer Aufwand, Datenverschwendung und ich sehe persönlich keinen Vorteil darin. Wenn mir ein bestimmtes Ergebnis interessiert so lass ich nur diesen einen durchlaufen. Aber ich verstehe dich schon grundsätzlich. Auch verstehe ich den Vorteil, wenn man alle Ergebnisse hat und dann einfach nochmal selber alles nachvollziehen möchte. Ich werde mir eine gute Lösung dafür überlegen. Kannst du also in der nächsten Version testen. Wann genau diese erscheint, weiß ich allerdings nicht. Ist es dringend oder hat es etwas Zeit? Mich interessieren schon die Ergebnisse, als wer in den SERPs vor mir steht. Den Free Monitor lasse ich durchlaufen und sehe mir dann an, wen ich in Zukunft überholen möchte. Wenn Du das irgendwie implementieren kannst, wäre das klasse. Bis dahin kann ich ja noch das Konkurrenzprodukt nutzen. das Update ist veröffentlicht. Das Einzige was du machen musst ist die RankingChecker.exe zu ersetzen. Der Rest sollte voll automatisch angepasst werden. Somit kannst du jetzt immer die Webseiten-Liste einer jeden letzten Suche anzeigen lassen wenn du darauf klickst. Ich würde mich sehr freuen, wenn du mir ein Feedback geben könntest ob nun alles zu deiner Zufriedenheit ist. Genau so habe ich mir die Umsetzung gewünscht ! Super, das freut mich wirklich sehr. Solltest du wieder mal ein Problem bzw. Feature-Vorschlag haben dann schreib deinen Vorschlag einfach wieder hier rein. Ich würde mich auch sehr freuen wenn du unter Kollegen das Tool bewerben könntest, damit noch viele weitere es auf Herz und Nieren testen können. Vielen Dank. Leider funktioniert bei mir das entfernen von Sucheinträgen nicht. Hi flumi, ja das stimmt. Aus welchem Grund auch immer trat das damals jedoch nicht auf. Ich habe das jetzt aber gefixt. Mit der 3.4er Version sollte das Löschen nun wieder klappen. Lass mich wissen ob nun alles funktioniert. 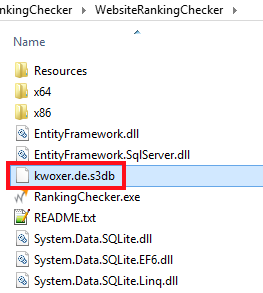 Du musst nur die RankingChecker.exe ersetzen. Das Programm ist super. Was vielleicht ganz schön wäre, wenn die Suchwörter nummeriert wären. Wenn das Limit 100 Abfragen liegt, kann man sich dann das abzählen sparen. - Optional die Suche nach einem Treffer fortführen. Man will ja auch wissen ob man noch öfters in der Liste vorkommt. I liked the Website Ranking Checker , clean design and very practical. But to my country , Brazil , does not seem to work properly because it does not have the Google.com.br option ... it is possible to implement, to work for Brazil? Hi Alessandro, indeed this is planned for the next version. Hopefully finding some time soone for this. I have a full time job, so I need to get a free weekend on this. But stay tuned, shortly it will come. Awesome tool dude, keep this up, best free tool I have tested. Ohh right, thank you. There were bad settings set. Now fixed them. Try to redownload. It should work properly now. Please let me know if it works. And sorry for late response. Gibt es ein Forum? Wie kann ich eine Tabelle löschen? Hey Niko, ganz oben hast du dazu 2 Buttons. Einer mit dem Plus- der andere mit Minus-Zeichen. Wähle in der Liste deine Tabelle aus und wähle dann den Minus-Button. Aber Achtung, du kannst das nicht rückgängig machen.